2. Several isomers are possible, each of which can be viewed as a quinone derivative. The term anthraquinone, however, almost invariably refers to one specific isomer, 9,10-anthraquinone (IUPAC: anthracene-9,10-dione) wherein the keto groups are located on the central ring. It is a building block of many dyes and is used in bleaching pulp for papermaking. It is a yellow highly crystalline solid, poorly soluble in water but soluble in hot organic solvents. For instance, it is almost completely insoluble in ethanol near room temperature but 2.25 g will dissolve in 100 g of boiling ethanol. 9,10-Anthraquinone is obtained industrially by the oxidation of anthracene, a reaction that is localized at the central ring. Chromium(VI) is the typical oxidant. It is also prepared by the Friedel-Crafts reaction of benzene and phthalic anhydride in presence of AlCl3. The resulting o-benzoylbenzoic acid then undergoes cyclization, forming anthraquinone. This reaction is useful for producing substituted anthraquinones. The Diels-Alder reaction of naphthoquinone and butadiene followed by oxidative dehydrogenation will also produce 9,10-anthraquinone. Lastly, BASF has developed a process that proceeds via the acid-catalyzed dimerization of styrene to give a 1,3-diphenylbutene, which then can be transformed to the anthaquinone. It also arises via the Rickert-Alder reaction, a retro-Diels-Alder reaction. In a classic (1905) organic reaction called the Bally–Scholl synthesis, named after Oscar Bally and Roland Scholl, anthraquinone condenses with glycerol forming benzanthrone. In this reaction, the quinone is first reduced with copper metal in sulfuric acid (converting one ketone group into a methylene group) after which the glycerol is added. Synthetic dyes are often derived from 9,10-anthraquinone, such as alizarin. Important derivatives are 1-nitroanthraquinone, anthraquinone-1-sulfonic acid, and the dinitroanthraquinone. Natural pigments that are derivatives of anthraquinone are found, inter alia, in aloe latex, senna, rhubarb, and cascara buckthorn, fungi, lichens, and some insects. Selection of anthraquinone dyes. From the left: C.I.Acid Blue 43 an "acid dye" for wool (also called "Acilan Saphirol SE"), C.I. Vat Violet 1, which is applied by transfer printing using sublimation, a blue colorant commonly used in gasoline, and C.I. Disperse Red 60, a so-called vat dye. 9,10-Anthraquinone is used as a digester additive in production of paper pulp by alkaline processes, like the Kraft, the alkaline sulfite or the Soda-AQ processes. The anthraquinone is a redox catalyst. 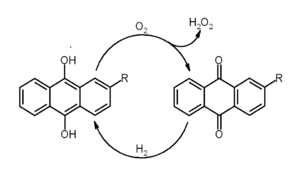 The reaction mechanism may involve single electron transfer (SET). The anthraquinone is oxidizing the reducing end of polysaccharides in the pulp, i.e., cellulose and hemicellulose, and thereby protecting it from alkaline degradation (peeling). The anthraquinone is reduced to 9,10-dihydroxyanthracene which then can react with lignin. The lignin is degraded and becomes more water-soluble and thereby more easy to wash away from the pulp, while the antraquinone is regenerated. This process gives an increase in yield of pulp, typically 1-3% and a reduction in kappa number. Sodium 2-anthraquinonesulfonate (AMS) is a watersoluble anthraquinone derivative that was the first anthraquinone derivative discovered to have a catalytic effect in the alkaline pulping processes. A large industrial application of anthraquinones is for the production of hydrogen peroxide. 2-Ethyl-9,10-anthraquinone or a related alkyl derivatives is used, rather than anthraquinone itself. 9,10-Anthraquinone is used as a bird repellant on seeds, and as a gas generator in satellite balloons. It has also been mixed with lanolin and used as a wool spray to protect sheep flocks against kea attacks in New Zealand. Natural anthraquinone derivatives tend to have laxative effects. Prolonged use and abuse leads to melanosis coli. 5 anthraquinones have been shown to inhibit the formation of Tau aggregates and dissolve paired helical filaments thought to be critical to Alzheimer's disease progression in both mouse models and in vitro testing but have not been investigated as a therapeutic agent. Several other isomers of anthraquinone are possible, including the 1,2-, 1,4-, and 2,6-anthraquinones. They are of comparatively minor importance. The term is also used in the more general sense of any compound that can be viewed as an anthraquinone with some hydrogen atoms replaced by other atoms or functional groups. These derivatives include substances that are technically useful or play important roles in living beings. The enzyme encoded by the gene UGT1A8 has glucuronidase activity with many substrates including anthraquinones. Anthraquinone molecules adsorbed onto a Cu(111) surface assemble into a highly ordered honeycomb structure. The self-assembly of organic molecules onto metal surfaces is a frequently occurring phenomenon. However, the honeycomb structure formed by anthraquinone is unique in its unusually large pore diameter (~5 nm). Additionally, the patterned structure of anthraquinone is supported theoretically using both classical (Monte Carlo) and quantum mechanical (DFT) approaches. ↑ Samp, J. C. (2008). "A comprehensive mechanism for anthraquinone mass transfer in alkaline pulping". Georgia Institute of Technology: 30. ↑ Sturgeoff, L. G.; Pitl, Y. (1997) . "Low Kappa Pulping without Capital Investment". In Goyal, G. C. Antraquinone Pulping. TAPPI Press. pp. 3–9. ISBN 0-89852-340-0. ↑ "Anthraquinone / Alkali Pulping - A Literature Review" (pdf). Project 3370. Appleton, Wisconsin: The Institute of Paper Chemistry. 1978-07-05. ↑ Goor, G.; Glenneberg, J.; Jacobi, S. (2007). "Hydrogen Peroxide". Ullmann's Encyclopedia of Industrial Chemistry. Weinheim: Wiley-VCH. doi:10.1002/14356007.a13_443.pub2. ↑ www.americanheritage.com Archived June 9, 2009, at the Wayback Machine. ↑ Dudding, Adam (29 July 2012). "How to solve a problem like a kea". Sunday Star Times. New Zealand. Retrieved 11 November 2014. ↑ Müller-Lissner, S. A. (1993). "Adverse Effects of Laxatives: Fact and Fiction". Pharmacology. 47 (Suppl 1): 138–145. doi:10.1159/000139853. PMID 8234421. ↑ Moriarty, K. J.; Silk, D. B. (1988). "Laxative Abuse". Digestive Diseases. 6 (1): 15–29. doi:10.1159/000171181. PMID 3280173. ↑ Pickhardt, M.; Gazova, Z.; von Bergen, M.; Khlistunova, I.; Wang, Y.; Hascher, A.; Mandelkow, E. M.; Biernat, J.; Mandelkow, E. (2005). "Anthraquinones Inhibit Tau Aggregation and Dissolve Alzheimer's Paired Helical Filaments in vitro and in Cells" (pdf). The Journal of Biological Chemistry. 280 (5): 3628–3635. doi:10.1074/jbc.M410984200. PMID 15525637. ↑ Ritter, J. K.; Chen, F.; Sheen, Y. Y.; Tran, H. M.; Kimura, S.; Yeatman, M. T.; Owens, I. S. (1992). "A Novel Complex Locus UGT1 Encodes Human Bilirubin, Phenol, and other UDP-Glucuronosyltransferase Isozymes with Identical Carboxyl Termini" (pdf). Journal of Biological Chemistry. 267 (5): 3257–3261. PMID 1339448. ↑ Pawin, G.; Wong, K. L.; Kwon, K.; Bartels, L. (2006). "A Homomolecular Porous Network at a Cu(111)". Science. 313: 961–962. doi:10.1126/science.1129309. ↑ Šimėnas, M.; Tornau, E. E. (2013). "Pin-wheel hexagons: A model for anthraquinone ordering on Cu(111)". J. Chem. Phys. 139: 154711. doi:10.1063/1.4825079. ↑ Wyrick, J.; et al. (2011). "Do Two-Dimensional "Noble Gas Atoms" Produce Molecular Honeycombs at a Metal Surface?". Nano Lett. 11 (7): 2944–2948. doi:10.1021/nl201441b.